Because the '82 Redskins' offensive line was busy bailing the original, probably-lady-killing-in-a-non-metaphorical-way Riggins out of jail, Ava went and purchased a whole hog at auction for a six-course BYOB dinner this Sunday. 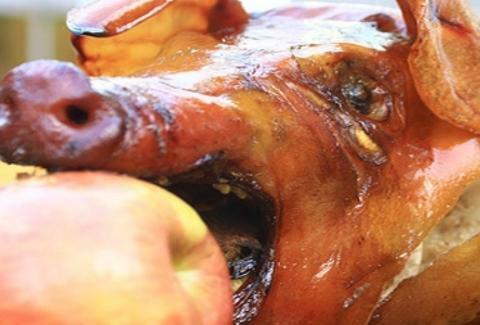 In a show of meritocratic democracy, each part of the pig will be prepared by a different chef: Matt McCallister (head), Nathan Tate (trotters), Scott Romano (belly), Taylor Kearney (tenderloin), Chad Bowen (loin), and Randall Copeland (desserts... also from the pig? ).